The month of April actually has two birth flowers, the Daisy and the Sweet Pea. We will discuss the Sweet Pea soon, but today is all about the Daisy! Daisies can symbolize innocence, loyal love, and purity. It is also a flower given between friends to keep a secret, meaning “I will never tell.” The Daisy is a spray flower, meaning that they have more than one bloom on a stem. (This does not include the larger Gerbera Daisy, which is in a category all it’s own!) This makes them an ideal filler flower as they give you a lot of flower for your money, but we have also been seeing Daisies used as the main focal flower in bouquets and centerpieces, especially in the Rustic and Wildflower designs. White Daisies are the most popular but they come in a large selection of Natural and Tinted colors, so be sure to check out our full selection here! 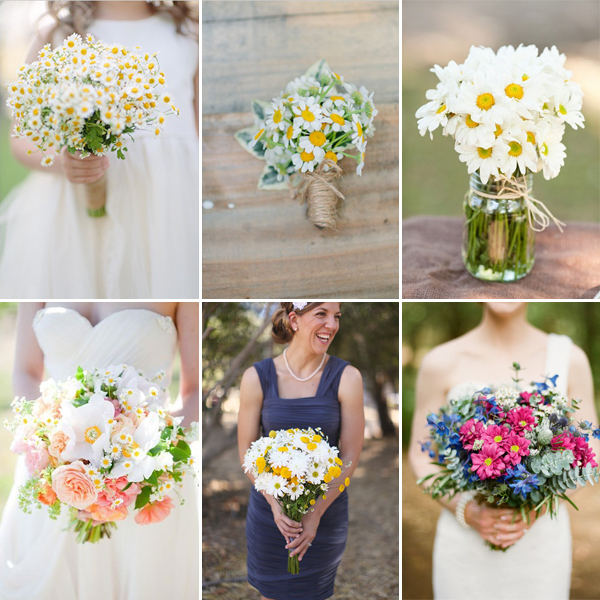 Use Daisies alone or pair them with other favorites such as Garden Roses, Ranunculus, and Greens. Our Daisies are packed in bunches of 6 to 8 stems which are bundled together by a rubber band and placed in a clear plastic sleeve. They can be ordered in 12 or 24 bunch quantities and are available year round. After receiving your flowers, open boxes and inspect your shipment to make sure everything looks good. Prep a few buckets, making sure they are clean, and then fill with a few inches of clean, cool water. Cut any straps holding your flowers in the box and remove any additional packing material. Do not remove the rubber bands holding the flowers together. Leave these on for the first 4 hours, or if you wish, until you are ready to start arranging flowers. Cut stems at an angle, under running water, with sharp shears or scissors and then place in the prepared bucket. Allow flowers at least 4 hours to hydrate, although we usually recommend letting them hydrate overnight. Keep your flowers away from direct sunlight, drafts, or any extreme temperatures. Change water every 24 hours if needed and make sure to check water level occasionally, since your flowers will drink a large amount of water within the first 24 hours or so. Now your ready to arrange! Have fun! Be sure to call 1-877-507-6737 or chat in at FiftyFlowers.com if you have any questions about the care or designing of your flowers!